From submarines to breast implants (1), smugglers never run out of ideas to successfully meet consumer demand. The market for illegal drugs is difficult to assess by nature. By some estimates, the industry generates about $500 billion annually (2). New smuggling methods are only a symptom of the failed drug war and prohibition. Let’s face reality: drugs are a real thing in society. The question becomes how to deal with it. Drug use should be a public health issue instead of criminal justice. In the U.S., prohibition has cost the public $1 trillion over 30 years. 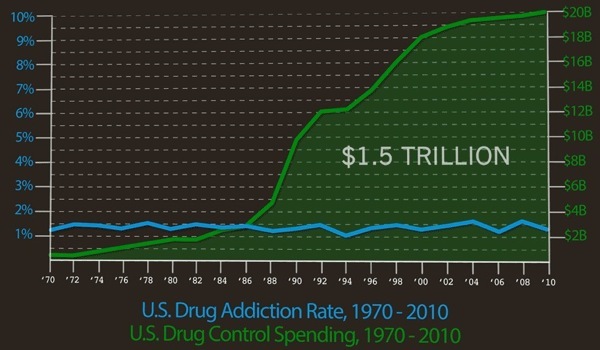 Taxpayers contribute $51 billion annually to fight the war on drugs (3). With this exorbitant spending, shouldn’t there be some results? If the expected result is reducing drug use, the cost of drug prohibition hardly equates to the benefits. Law enforcement has seen relatively no improvement in convicting drug traffickers (5). Even worse, the rate of drug use and addiction has remained basically unchanged (6). In other words, prohibition has not significantly affected the supply or demand of narcotics. Due to the market structure, firms focus their resources on reducing law enforcement risk as opposed to improving “customer experience”. Users experience higher consumption risks (i.e. mortality rates). Individual drug smugglers also face a heightened risk of in-transit. In some countries, they just kill you (7). As a result of diminished competition and quality, drug mortality has more than doubled since the 1980s (8). Due to a lack of courts and open competition, market share can only be established through violence. The long term result is only the most violent cartels and dealers remain. If a new firm is established, competing cartels can and do kill them off (9). This acts as its own barrier and keeps out less violent firms. Economically speaking, government protects the cartels from competition by creating a less desirable market. Law enforcement is subject to the same bureaucratic incompetence as any other government operation. There are numerous stories where police have raided the wrong home, often killing or injuring innocent people (10). Police have become more lucrative in their procurement of military grade weapons (11). Civil liberties have been violated on numerous occasions (12). These unquantifiable costs add to the already enormous burden on society. Drugs use externalities have been comparatively overstated. In the U.S., narcotics are responsible for about $11 billion in health care costs. Comparatively, tobacco costs about $96 billion (13). If drugs were legalized, there could be a slight uptick in these costs. However, it would most likely be a net gain considering the total costs of current policy. CONCLUSION: Drug prohibition FAILS the cost-benefit policy analysis and should be repealed immediately. Our economy is missing out on a substantial growth opportunity that could also benefit our currently abysmal fiscal outlook.